Richard Hunt is a sculptor from Chicago Illinois. He has won many awards for his work and has been exhibited nationally. 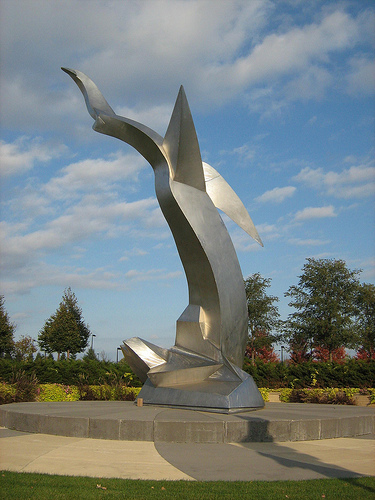 He creates large works in metal. Much of the artwork shown was taken from the MoMa. His exhibit in the Pfac included sculptures, maquettes, and prints. Much of Hunt's work has gestural qualities on both paper and sculptural work. He names his influences as Pablo Picasso, Julio Gonzalez, David Smith as well as African art. 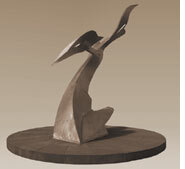 My favorite maquette that was displayed was the Flight Forms, 2002, for its beautiful shape and flow. I also really liked his black and white lithographs that showed a kind of organic abstraction. Especially the one entitled Prometheus, 1956 (which I can't find a picture of online :( ) I'll put some of this other prints that were shown in his exhibit up anyways though. I love the bold lines and organic shapes and soft orange color.